What is your male body type? 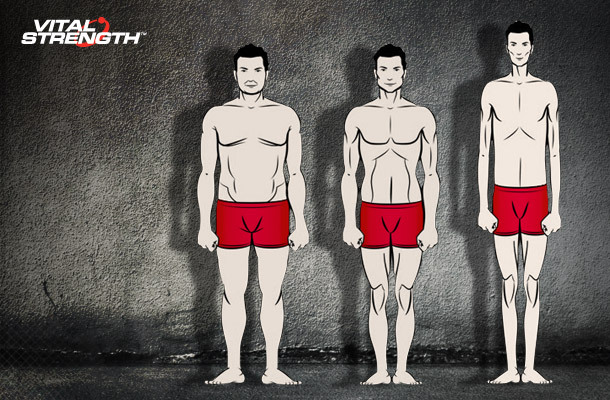 Are you an Ectomorph, Mesomorph or Endomorph and how does this affect your approach to diet and building muscle? Yes, it’s true some people are naturally skinny, naturally lean and others naturally bulky. Male Body types and genetics definitely play a role in the way our bodies look and each body type requires a different approach to building muscle. Broadly speaking there are 3 different male body types. It’s important to be able to identify and understand your body type. Here are the key characteristics and tips on how to build muscle for each male body type. Is this your male body type? Often referred to as “hardgainers,” Ectomorphs are guys who want to get big but no matter what they try, gaining weight and size fast doesn’t come easy. For many Ectomorphs a fast metabolism gives them a naturally lean and wiry physique and stops them from gaining weight. However even guys with this male body type can gain weight and build big muscle. Low Reps, Heavy Weight, Long Rest – The primary focus of your body type workout needs to be on lifting heavy and therefore keeping your rep range low (6-10reps). Progressively overloading your muscles is the key to gaining muscle mass and training using a variety of different techniques and percentage of rep-maximums will help you build muscle mass. Eat BIG, Eat often – To gain weight and build muscle size an Ectomorphs calorie intake needs to be greater than the energy used. If you are this male body type you need to be over-feeding your muscles and consuming more calories in your diet than the average guy. 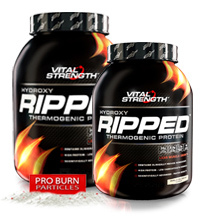 Vitalstrength Rapid is the ideal protein powder for Ectomorphs wanting to build muscle mass. 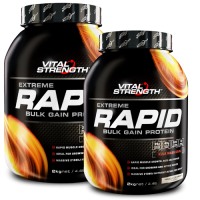 To ensure your size gains are maintained and your efforts in the gym are never wasted, Vitalstrength Rapid is packed with calories, protein and muscle building nutrients. For more hardgainer tips click here. Often referred to as “the lucky ones,” Mesomorphs generally have naturally athletic physiques, large bone structure and of any body type they find building quality muscle the easiest. Mesomorphs are the best physiques for building lean muscle with their well defined muscles, rectangular shaped body and ideal metabolic rate. Combine Compound Movements & HIIT – Compound movements are those that involve several muscle groups and more than one joint and are the biggest muscle builders. Examples are squats, leg press, lat pull downs and bench press. Also use HIIT (high intensity interval training) to push your fitness limitations and build lean muscle. Eat a balanced diet packed with quality protein – Mesomorph’s do well on a balanced diet that is packed with nutrients and high in protein. So if you are this body type, be sure to stock your fridge and pantry with foods high in protein including chicken, lean beef, steak, eggs and nuts so that these high protein foods are always on hand when you need them. A high protein diet that is also balanced with quality carbs and fats is recommended for best lean muscle results. Vitalstrength Whey is an ideal protein for mesomorphs wanting to build and maintain lean muscle mass. 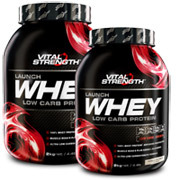 Vitalstrength Low Carb Whey Protein is an advanced of ultra pure WPC/WPI with essential nutrients for muscle growth and repair. This body type is naturally big and strong and generally endomorphs have stocky bodies with sluggish metabolisms meaning excess calories are more likely to be stored as fat. Gaining size is not the problem for endomorphs but if you are this body type you need to refine your diet and training to build quality muscle not just bulk. Combine weights with High Intensity Cardio – For best fat burning results for endomorphs combine resistance training with high intensity cardio. Bursts of high intensity cardio between heavy sets will lift your heart rate and raise your fat burning potential during your workout while resistance training will raise your muscle metabolism during your workout and for a long time after each session. The more muscle mass this male body type can build lifting weights, the more fat and calories you will burn, even at rest. Eat six meals a day – Fuel your endomorph metabolism with at least six meals a day, aiming to eat every 2-3 hours to maximise fat burning. Eating smaller meals more frequently makes this body type more efficient at burning food and also keeps you satisfied throughout the day and stops bad eating habits. Make sure you power each meal with high quality protein which is a key fat burning nutrient that instantly helps to burn fat for men. Try adding a scoop of Vitalstrength Hydroxy Ripped to your cereal in the morning or have a protein shake between main meals. Ramp up your muscle building results by identifying your male body type, then eat and train accordingly. So what body type are YOU?